Hand fabricated and finished by Alumisonic Inc. to the finest detail, the Evo-Classic Vintage Copper guitar is a durable and light weight Copper plated aluminum hybrid instrument. With the addition of a custom copper plated USA made Bigsby B-5 Tremolo, the Evo-Classic Combines the features of our Classic and Master Alloy guitars with 2 Seymour Duncan Pearly Gates humbuckers (coil tapped). The guitar also features our exclusive Bigsby style B-5 Humbucker bridge plate, specially designed and fabricated by AlumiSonic for the Evo-Classic HH combo. Both Pickup positions are backed with “ported” Honduran mahogany chambers for a tasty hybrid effect of warm tonewood with aluminum overtones and sustain. The perfect combination of materials for Seymour Duncan’s “sweet, hotter than vintage” Pearly Gates pickups in Humbucker and / or coil tapped mode. A great combo for blues, classic rock, southern rock, and hard rock. Seymour Duncan Pearly Gates humbuckers light up some of the natural aluminum and Mahogany overtones that would normally be lost with any other Alnico II pickup. As an aluminum instrument, the Evo-Classic is noticeably capable of a greater spectrum of harmonic frequencies (low and high) than its traditional wood predecessors. Due to the greater response of the 6061 aluminum alloy, lower pitch notes project a fatter frequency along with incredibly pure sounding crystal clear resonance overtones. Mid to upper octave notes carry through with an excellent harmonic clarity and fullness that would be impossible to achieve with any other material. The custom African Padauk neck compliments the body with incredible depth, warmth of tone, and sustain. The stability of Padauk also works well with our aluminum bodies by having less of a reaction to climate changes, than Maple or Mahogany. AlumiSonic also includes the convenience of a neck heel side truss rod adjustment, for better access. Like all of our copper plated guitars, the Evo-Classic receives special attention to the finest finishing and mechanical details. AlumiSonic neck pockets and hardware positions are accurately laser cut and pre-aligned to within .005” with a slightly undersized neck pocket. Each neck pocket is then flawlessly hand filed and adjusted to conform to the heel of your custom made neck for a perfect fit. Every screw and competent of the Evo-Classic is individually hand polished, copper plated and lightly tarnished to match the body. Ordered to your custom requirements, each Evo-Classic is entirely fabricated as a custom guitar. The custom made African Padauk neck is available with a variety of back contours, fingerboard, and fret wire selections. AlumiSonic will provide neck radius contour drawings as well as actual photographs of your select fingerboard wood before fabricating the guitar. 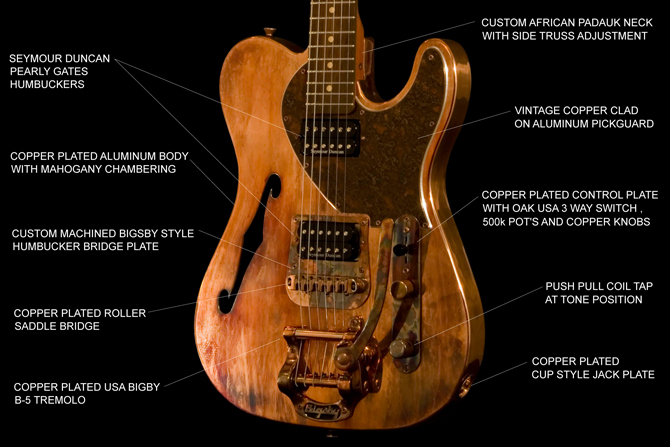 As with all of our guitars, we guide each customer through an itemized quotation of every option on the instrument. The Evo-Classic is the perfect combination of the best that aluminum guitars have to offer, while designed to go beyond AlumiSonic to your custom preferences. BODY: 6061 Aluminum hollow body with ported Mahogany chambering. BODY FINISH: Polished and tarnished copper or quadruple dipped show chrome. ELECTRONICS: OAK USA made 3 way switch, 500k pot's with Push / Pull coil tap. BRIDGE: Roller Saddle Bridge, Bigsby USA B-5 with custom AlumiSonic bridge plate. Pick Guard: Copper Clad on Aluminum for Vintage Copper model, or for the Show Chrome body option: Show Chrome on Aluminum, or Satin Black Anodized on Aluminum. TUNERS: Genuine Kluson Deluxe with center hole (custom reliced) 1:14, or for the Show Chrome Body option: Grover Mini 18:1 Locking Rotomatics. NECK: African Padauk neck with standard thin, or custom back contour. Compound 10"-16" radius Indian Rosewood fret board, or custom select fretboard with (22) 6105 frets or custom choice (dressed and crowned). Cream dot inlays. AlumiSonic style headstock with metal logo inlay. NUT: AlumiSonic Custom Self lubricating Delrin or Graphtech Tusq.